Even though the Beijing Olympics are practically upon us, the International Olympic Committee is always focused on the future. The IOC just recently announced the shortlist for the XXXI Summer Olympiad, to take place in 2016. Four hopeful cities, Chicago, Tokyo, Madrid, and Rio de Janeiro are now vying for the ultimate sports blazon: being an Olympic host. So we took a moment to handicap the contestants. Rio is the only candidate in a country which hasn't yet hosted the event, but it is no stranger to big sports competitions, having successfully staged the XV Pan American Games last year. A winning bid for Rio would also mark the first time for the event to be held in South America. Chicago and Tokyo have both won previous bids—Chicago's bid, however, was transferred to St. Louis to coincide with the World's Fair that year (1904)—and the Japanese capital served as host to the Games in 1964. A Madrid win would come 24 years after Barcelona bore that torch for Spain's first Olympics in 1992. Memorial Day weekend has come and passed—ushering in the ritual advent of white pants, swimsuit angst, and, more exciting for all involved, the summer vacation season. (Excuse our brief pause to cue a collective “yippee!”) Exhilarating for those with upcoming adventures to anticipate; utterly depressing for the rest of us. And second worse to not having travel plans? The inevitable return to the daily grind after vacation. 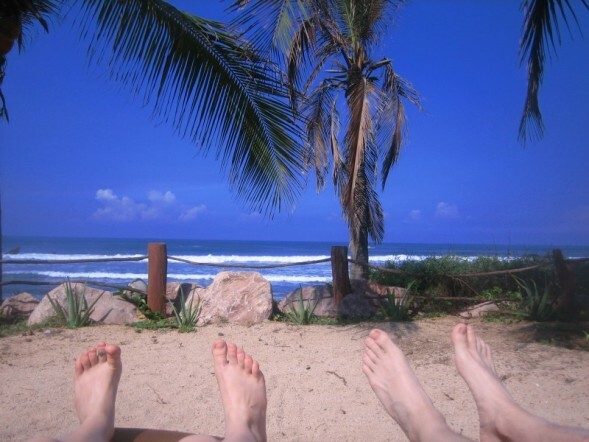 Lucky for me, I work at a travel magazine and am allowed to entertain these notions, all in the name of “work.” My mind wanders to the beach mid-morning, so I pen a blog entry about the Mexican bungalow where I relaxed last week. My stomach pangs for a tasty sope (a bean-and-crudités-topped puffy tortilla), my new favorite Mexican antojito, rather than the humdrum salad I mechanically packed for lunch this morning. So I Google "traditional Mexican recipes," telling myself I’m doing invaluable research for IT readers. A few days of serious lazing in the tiny coastal village of Troncones, Mexico, confirmed for me a couple of truisms we subscribe to at IT: Low-impact lodging can, indeed, be comfortable, and escaping the urban concrete jungle to spend some quality time in nature is an invaluable refresher, even for the most devout city lover. I first discovered Casa Viva happenstance while tracking a story lead for this very blog about the owners' new eco-friendly resort, Playa Viva, in nearby Zihuatanejo, set to open in early 2009. Attracted by the sustainable mantra of the owners and bummed that Playa Viva wouldn't be open in time for my own trip, I was thrilled to read that their already-open property, Casa Viva, consists of three palm-thatched (and solar-paneled) bungalows designed by organic architects and built by local Mexican craftsmen with natural building materials (wood, stone, palm, clay, sand). And really, all the convincing I needed to book the place can be summed up in six incredible words: "all the beer you can drink"—listed absentmindedly among the amenities included in the room rate. Uncovering Culture: As much as a resort experience can offer culture, Club Med introduced an authentic taste of Mexico. Kid's activities included making pinatas and masks, and painting clay sculptures. Evening entertainment featured costumed traditional folk dancers and live mariachi music. One evening, vendors from Zihuatanejo set up an open-air market and sold wooden saints, mosaics, papier-mache puppets, wooden toys, and hand-embroidered dresses. In the dining room, Mexican cuisine was prepared fresh daily. We tried dishes such as chilaquiles (an egg and chicken casserole with green salsa), chiles rellenos (stuffed peppers), huachinango (grilled red snapper), homemade tortillas, tortas (sandwiches), and salsas made from tomatillos and local guavas. Bye-bye beads: Less is no longer more when it comes to amenities at Club Med. 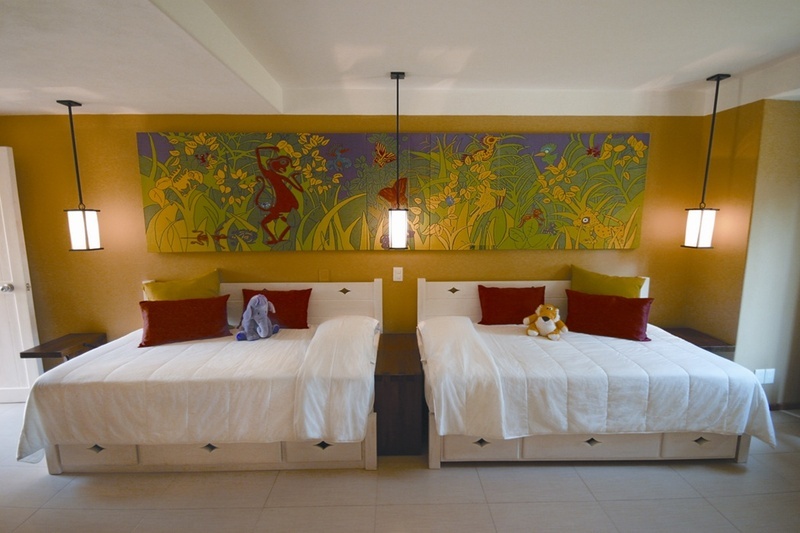 Gone are the days of unlocked guest rooms and exchanging beads for a cerveza. New to the scene are spacious family rooms with kid-high, built-in desk areas (perfect for coloring during pre-dawn wake-ups), flat-screen TVs (though they don't really need them), and hair dryers, thick robes, and slippers. The showers are equipped with an extra handheld nozzle, which is great for getting shampoo rinsed off little ones. Club Med Ixtapa's $20-million makeover also included spruced-up outdoor sitting areas, with chic chocolate brown rattan furniture topped with salmon-colored pillows. Around the pool, kids and adults can snooze and get shelter from the strong midday sun on large, canopied daybeds—they seem more SoBe than Club Med, but somehow are really practical in the setting. 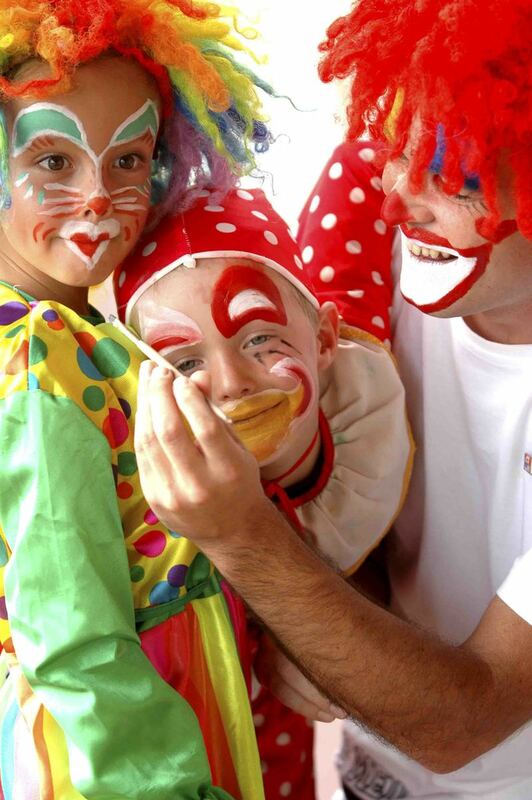 The property is a kid haven: Facilities include a circus trapeze area, a restaurant just for kids with petite tables and chairs, extra pools to accommodate toddlers and new swimmers, an in-line skating area, miniature golf, and tennis courts. On the water, a fleet of sailboats, catamarans, and sea kayaks are available to use daily. Adults will like the new spa with its outdoor chaise lounge terrace—perfect for taking in the wide ocean views and sipping tea before your treatment. Can you leave to explore? Of course you can, and we did for a day in Zihuatanejo, an authentic fishing village about ten miles away. The taxi ride from the hotel cost $14. We went to the large outdoor market that is just off the waterfront and bought handmade leather sandals and local sea salt, vanilla, and coffee to bring home. Go early to catch the fishermen bringing in their morning haul. At noon, several food vendors along the waterfront grill the fresh catch and sell delicious fish tacos and bocadillos (little sandwiches). 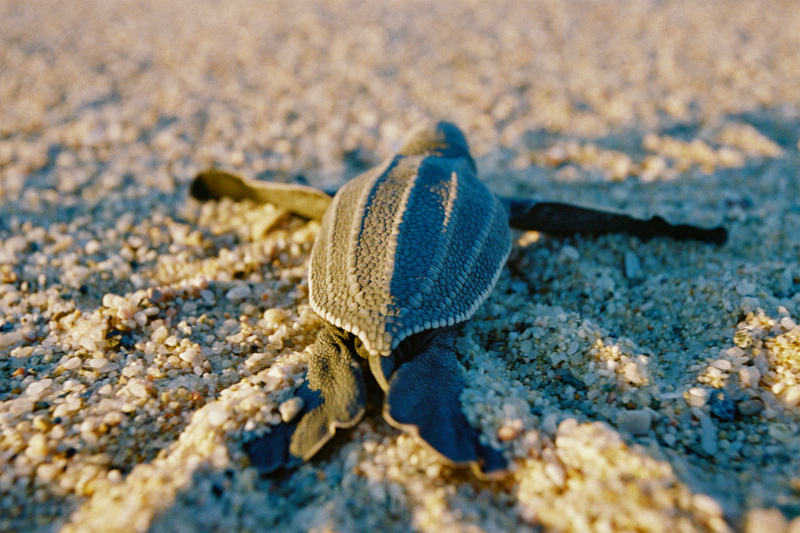 Club Med has programs for visitors to see local endangered turtles and baby crocs. They also offer horseback riding on a local beach, deep sea fishing (where my husband and son spotted humpback whales and sea turtles), and boat excursions to a few nearby islands. Since July last year the preserve has been under threat from a Sinaloa-based company hoping to develop on approximately 750 acres of the precious land. The company, with the help of corrupt government officials, was able to successfully register falsified land deeds in order to claim the land and have since been attempting to clear it for development. René Pinal, owner of the preserve and founder of the non-profit organization ASUPMATOMA (Association for the Environment and the Marine Turtle in Southern Baja) is battling with the company to prevent them from bulldozing and building on his property that consists of more than three miles of the pristine shoreline. So I gave Pinal a call to get the full scoop. Pinal has been a developer in the area for two decades, so he's witnessed much of the rapid growth that I noted in my piece. But he has chosen to pursue low density buildings, use solar energy sources, and install biodegradable septic systems on this properties. He also has become a passionate conservationist in the area—leaving over 2,000 acres of his land undeveloped in order to protect wildlife and preserve the nesting habitats of several breeds of sea turtles. He created ASUPMATOMA more than 18 years ago, and maintains a series of three reserves on his property on the Pacific side of the peninsula, north of Cabo. That is, he says, until a developer used false documents to lay claim to his land. Mexican authorities signed off on the falsified papers, he claims, and he's now fighting corrupt practices to regain his land. We're still smitten with reader Lolly's textile-themed trip to Peru from a few months ago, so we were glad to see Laura Morelli's recent shopping column about weavers in Guatemala continue along that thread. 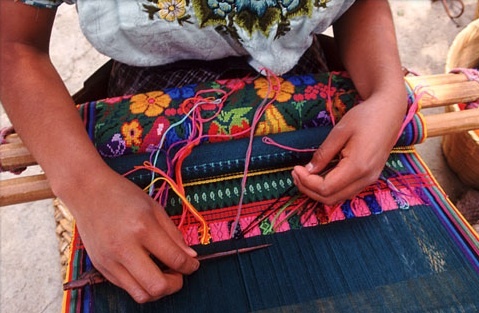 Mayas in the Guatemalan highlands are still weaving beautiful textiles much the same way as their ancestors did 1,200 years ago. Today, women weave cotton and wool on a backstrap loom, which is looped around the weaver, who sits on the ground. Many weavers now use chemical dyes to color the fibers, though some still use natural dyes derived from moss, bark, and other plants. Learn more about what to look for when buying traditional handmade Guatemalan textiles, like the huipil (pronounced "wee-peel") in Laura Morelli’s column, The Genuine Article, and how to find handmade crafts anywhere in our Authentic Shopping Guide. To see more photos of Guatemala, check out Peter McBride's Guatemala photo gallery. Beloved Traveler senior researcher Meg is in the midst of planning her honeymoon—she's thinking warm, English- or Spanish-speaking (her fiancé is Salvadorian), and on a budget. She thought Costa Rica would be nice, but found that hotels were either super-luxe (and out of her budget), or very rustic. "I'd like to have hot water," she confesses. "And I want to see the sloths in the trees, but not be in the trees with the sloths." It is her honeymoon, after all. So the Traveler research team was put to the test, and we think we might have found something that works. 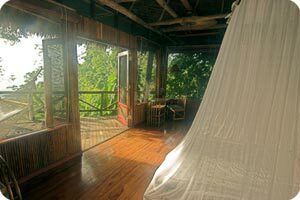 Travel company NatureVacations has created a 100% carbon-neutral Costa Rica vacation. That means every pound of carbon emissions their customers use on their seven-day/six-night journey is offset in some way. And travelers like Meg won't have to worry about hot water—the accommodations are definitely eco-chic. How exactly does this carbon-neutral vacation work? Upon arriving in San Jose, all vehicle transfers from the airport to Finca Rosa Blanca for the first night's stay are carbon-neutral certified and use bio-diesel fuel. 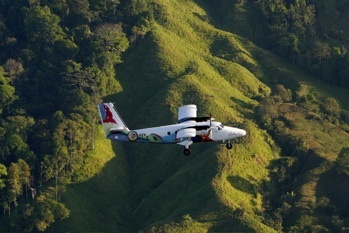 The next day, travelers are again transported by the same eco-friendly vehicles to Tobias Bolanos Airport where they will fly (on carbon-neutral airline NatureAir, pictured right) to Lapa Rios Ecolodge (above), located on 1,000 acres of private nature reserve. 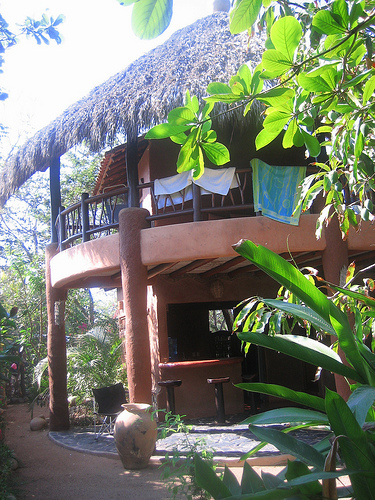 During the next five days at Lapa Rios, visitors will get to: plant a tree, take a sustainability tour of the lodge, learn about traditional Indian medicines of the rain forest, go on an environmental walking tours of the reserve, and eat organic, sustainable cuisine. Of course, I couldn't find any information on how the flight from the States to Costa Rica is offset... it looks like that is up to the traveler's own prerogative. 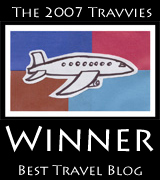 For other eco-conscious tour operators, don't miss our Tours of a Lifetime in the May/June issue of Traveler. In the Destination Watch column in our May/June issue, "Promise and Peril," Traveler's Geotourism editor Jonathan Tourtellot's tells us that travelers should put a value on authenticity, and make "intelligent choices" when you visit a place. "When you seek authenticity, and pay for it, you're not only sending a message, you're helping protect a local asset," he writes. 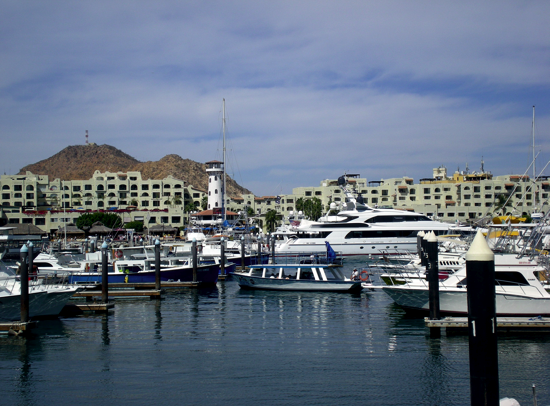 He mentions IT editor Janelle Nanos's recent trip to Cabo San Lucas as an example of a place on the cusp of tourism overload. Nanos offers her full story here. Settling into my flight home from Cabo San Lucas, I struck up a conversation with my sunburnt seatmate. Our trips, we both agreed, were tremendous, but we quickly realized they were also very different. He'd spent much of his time sipping margaritas at his all-inclusive resort, and spoke of tallying up a $500 tab at the bars following an afternoon booze cruise. I too swilled a few margaritas, but I also wandered up to the artist community of Todos Santos, explored Pacific coast beaches, and stumbled upon a local semi-pro soccer game. He’d gone to relax and get away. I went to experience the place, but had to wander outside its tourist precincts to find a true sense of local culture. It’s been a long time since Cabo San Lucas resembled the Baja of Steinbeck’s novels. Now it’s most commonly referred to as the “next Cancun.” Timeshare hucksters shill “beautiful” condos that have yet to be built, and driving the corridor from Cabo San Lucas to San Jose del Cabo is like watching time-lapse photography of construction. Grabbing my ocean kayak from JT Water Sports, on the tip of Playa el Médano, I gawked at the eight-million-dollar Hacienda condos rising from the shoreline like monstrous sand castles. None of the hotels and bars that lined the beach were there 15 years ago. Hotel Central Editor Susan O'Keefe wants your take on televisions in hotel rooms. Is bigger really better? Travel Agent Central recently reported that Sandy Lane, the luxury resort located in St. James, Barbados, where celebrity guests have included Mick Jagger, Frank Sinatra, and Jackie Kennedy, will close on August 31 and reopen on October 3, to undergo a $6-million makeover. Renovations to the hotel will include new outdoor patio furniture, new guest room bedding and drapes, and TVs—all 112 rooms and suites will upgrade from huge 55-inch TVs to 70-inch monsters. Reader, I don't know about you, but if I'm going to the Caribbean, I'm not really planning on spending much time in my room, let alone flipping through channels with a remote. 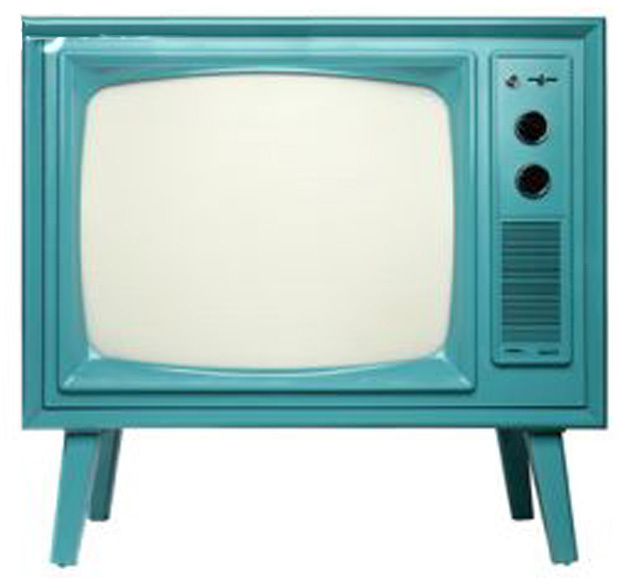 Have we gotten so caught up in bigger being better when it comes to flat-screens and plasmas, that 15 inches will really make a difference, especially in a bedroom? Don't get me wrong, I like my TV when I'm traveling for business and sitting in my characterless room eating bland food from room service. And I like giant TV screens during events like the Super Bowl, when I can leave the family room to refill the chip bowl and still see the game from my kitchen. But the Caribbean is a getaway. It's where you go to dig your toes in the sand, plunge into the crystal-clear water, and lounge beachside for long periods of time with a fruity drink and a good book. At Sandy Lane, outdoor recreation includes kayaking, sailing, state-of-the-art golf courses, tennis, and swimming with Hawksbill turtles that play and feed along the inshore reef. So, tuck the TV remote in a drawer and get outside. But I wonder, what amenity must you have in a hotel room? Mini bar? Stationery with the hotel's logo? Slippers? Q-tips? We'd like to know what you can't live without, whether you're at a resort in the Caribbean or a motel on the side of the road. It's still a bit cold here in D.C. (oh springtime, where art thou? ), and I can't think of a better way to escape the rainy weather than by heading to the beach. Half Moon resort in Jamaica has some great green options for travelers wanting a bit of sustainable luxury. Located on Jamaica's northern coast on a two-mile stretch of private beach, Half Moon is the first hotel to be listed in the Caribbean Hotel Association’s Green Hotel Hall of Fame, and for good reason. The resort uses nontoxic laundry detergents and fresh, local ingredients in products at its 68,000-square-foot Fern Tree Spa, and its staff is trained to ensure awareness of environmentally friendly practices. 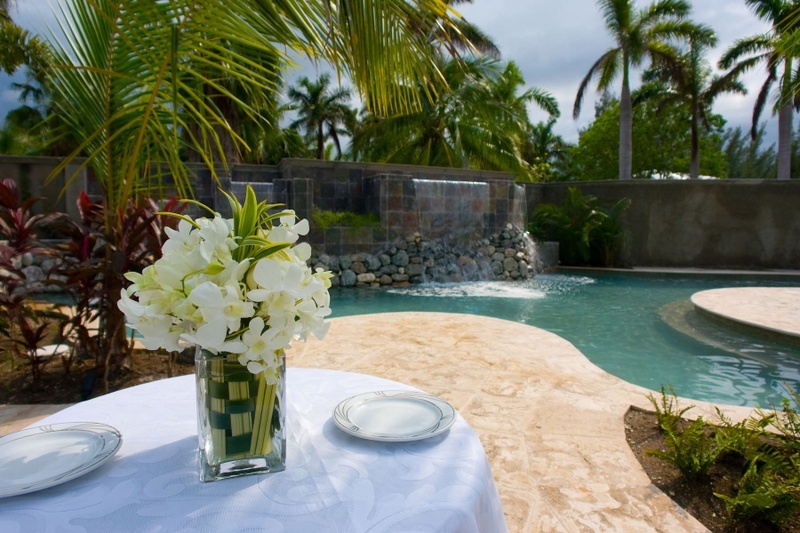 The restaurant has its own herb and vegetable garden (as well as fresh mangoes, lemons, and bananas), there's a "plant a tree" program for newlyweds, and the hotel has an extensive water treatment plant. One of the unique things about the resort is its solid waste management program. Half Moon's own upholstery shop takes fabric scraps from old cushions, drapes, and furniture and makes them into dolls for the resort's Anancy Children's Village or into bedding for the Equestrian Centre. I'll be on the next flight to Jamaica, and will bring my eco-friendly sunscreen, of course.